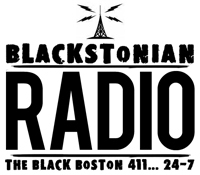 The Chi Chapter of Kappa Alpha Psi Fraternity, Inc.
BOSTON (February 18, 2014) – For nearly a century, Kappa Alpha Psi Fraternity, Inc. has been deeply rooted in Boston and in the city’s many academic institutions. 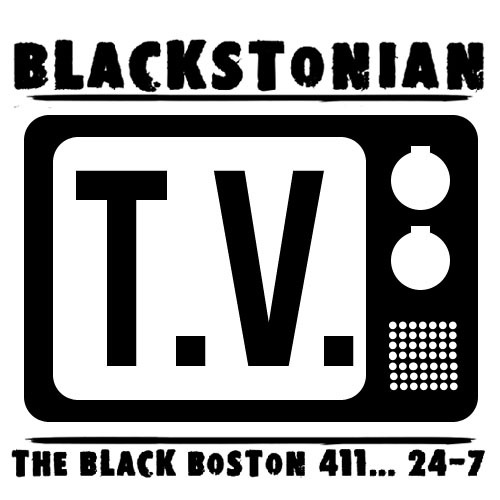 The Fraternity’s Boston-Metro affiliate, Chi Chapter, will host Kappa Week 2014 – Monday, February 17, 2014 through Sunday, February 23, 2014 – with programming aimed to commemorate the chapter’s 90 years of contributions to the Boston community. “Brothers and Sisters Can We Talk about Justice?” an interactive discussion led by Dr. Marc Lamont Hill, CNN Political Analyst and BET News Correspondent. “Who Has the Answers”, hosted with Sisters United, an organization dedicated to assembling the distinct voices of Boston University’s undergraduate women. “Our banquet and anniversary will be a wonderful event that will bring stakeholders and community members of the Greater Boston area under one roof to celebrate this extraordinary milestone,” said Undergraduate Grand Board Member, Abdul Hafiz, of Chi Chapter. The gala and banquet are open to registered guests; tickets are available for purchase. During the 1920s, racial prejudice and discrimination kept many African American students from attended colleges and universities in the nation’s northeast. At this time, local members of Kappa Alpha Psi dreamed of having an active chapter of their Fraternity in Boston. Recognizing the need to bring their fraternal commitment “to achieve in every field of human endeavor” within their academic community, a group of local members began the Fraternity’s Chi Chapter. At its inception, Chi Chapter included members from Boston College, Boston University, Harvard University, Massachusetts Institute of Technology, and Tufts University. Today, Chi Chapter is a city-wide charter that covers Boston and Cambridge area institutions, including several undergraduate members from Boston College, Boston University, Harvard University, and Northeastern University. Fraternity members play an active role in the Boston community, by way of its Boston Kappa League, a local youth development program that promotes honorable achievement among high school aged young men of color. Chi Chapter also maintains a local installation of the Fraternity’s National Service Program Guide Right, created for the educational and occupational guidance of youth, primarily inspirational and informational in character. Its reach extends to high schools and colleges alike. Chi Chapter partners with the Paul Robeson Institute for Positive Self-Development (PRI) to tutor Boston’s high school students each week in areas of mathematics, science, English and social studies. Chi Chapter will also award two Diamond Scholarships to deserving high school seniors. The funds are intended to aid in the students’ quest for academic achievement. “The Chi Chapter of Kappa Alpha Psi Fraternity, Inc. has stood the test of time over the last ninety years. In keeping with the purpose of the fraternity, ‘to achieve in every field of human endeavor,’ Chi Chapter has initiated men who have been exemplary members, as well as major contributors to the well-being of the Boston area and the community-at-large,” Bates said. 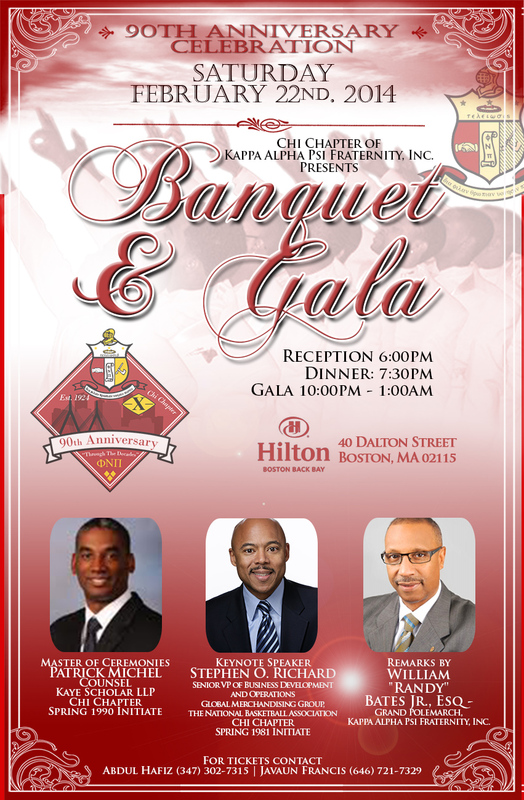 Visit www.chi1924.com/chi90th for more information on the 90th anniversary celebration of Kappa Alpha Psi Fraternity’s Chi Chapter. Kappa Alpha Psi Fraternity, Inc. is an international organization founded on the campus of Indiana University on January 5, 1911. Since its inception, it has trained more than 150,000 men, particularly undergraduates, for leadership roles in their communities and the attainment of a high degree of excellence in their academic pursuits. The International Headquarters is located in Philadelphia, Pennsylvania. About Chi Chapter, Kappa Alpha Psi Fraternity, Inc. The Chi Chapter of Kappa Alpha Psi Fraternity, Inc. was founded on February 15, 1924 on the campus of Boston University. Chi Chapter is a city-wide charter currently covering Boston and Cambridge area institutions, including several undergraduate members from Northeastern University, Harvard University, Boston College and Boston University.